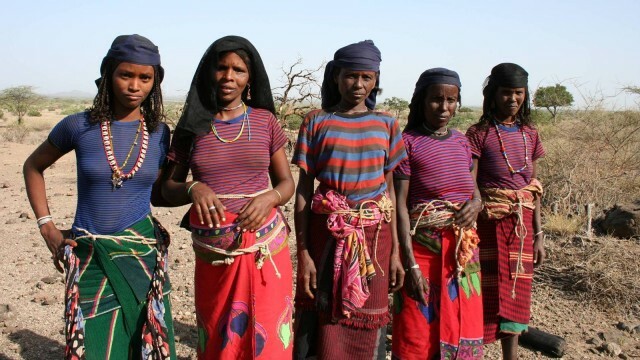 THE AFAR PEOPLE live in the rocky desert terrain of eastern Africa, in an area called the HORN OF AFRICA. Most of them live in the countries of DJIBOUTI, ETHIOPIA, and ERITREA. The territory, once known as the French Territory of the Afars and Issas, became Djibouti in 1977, when France gave the people their independence. Although most Afars live in the desert, some live in the Awash Valley and the forests of northern Djibouti. They number about 1.4 million in all. The name Afar comes from the first two letters of Africa and Arabia. The Afars are a cohesive group and did not like having their territory broken up into the countries of Djibouti, Ethiopia, and Eritrea. The Afars in Djibouti are outnumbered by the Issas and were unhappy with the Issa leadership. There was much unrest among the Afars during the 1990s, but a peace accord was finally signed in 2001. Djibouti is important because of its strategic position at the mouth of the RED SEA. It serves as a port for goods leaving and entering eastern Africa. Although peace now reigns in Djibouti, the Afars are the target of economic and political discrimination. The Afar people are tall and proud, with narrow, straight noses, thin lips, and small, pointed chins. The Afars are known as fierce fighters. They have managed to survive under the worst conditions in one of the hottest areas in the world. The Issas are their main enemies. A man is judged on his bravery and strength among the Afars. The Afars subsist mostly on a diet of bread and milk, and many are malnourished. They are often anemic and are prone to malaria because of their poor diets. Historically a pastoral people, over half of the Afars live a nomadic life, moving their livestock wherever they can find grazing. They raise sheep, goats, camels, and cattle. Rainfall is sparse in the area, so the people are forced to move often in search of grass for their animals. Both droughts and floods have had a negative effect on the economy of the Afars. Some Afars living along the Red Sea fish for a living. The Afars have also mined salt for many years and export it to Ethiopia. Most Afars embrace the Muslim religion, which differentiates them from other tribes in the area that are Christian. Muslim practices are supplemented with ancient animist customs as well. Why Does Insolation Vary from Place to Place? What Causes Changes in Insolation? What Controls Wavelengths of Radiation?